A Canadian group dealing in that biker rock/early punk mixed with doom metal and dripping with occult/60’s biker films aesthetics, a la Satan’s Satyrs and Alucarda. Death Wheelers dropped three 2 song demos in March/May; The Death Wheelers, Motorpyscho and The Death Wheelers Theme. The catch here is that all tracks are strictly instrumentals outside of the expected samples, which could be a potential problem for people. This is, like with Alucarda’s debut, the fact that with the fuzz heavy guitar and more garage band sounding production tied in with no real song variation, everything tends to become a mix of fuzzed out guitars playing sleazy biker punk riffs and pounding drums. Everything melds together even more so here without vocals, but altogether nothing is boring, badly written or put together and I’ve found myself consumed by the general atmosphere of each release. Its fun, fuzzed out and catchy despite the lack of variation. Overall, with all 3 demos put together there’s almost 18 min of material and while I wouldn’t rate this quite as high as Satan’s Satyrs’ material these 3 releases are worth checking out, especially since they’re on bandcamp for name your price. Phrenelith are a Danish four piece Death Metal group formed last year and so far only have a self titled demo under their belt from March this year. With Undergang’s vocalist taking vocal and guitar duties as well as Alucarda’s guitarist taking lead guitar, vocal and some bass duties, this 2 song demo is a murky sounding affair. The production is demo quality; raw, murky and when the drums really get going they effectively meld together with the lower end of the guitars, creating a sort of cacophony, with the guitars themselves sounding like they’ve been drowned in festering pools of mud. The vocals are murky and deep, and the bass can sometimes be heard quite well or disappear completely. Musically Phrenelith takes inspiration from the Incantation style of cavernous death metal and honestly with the murky production quality, the cavernous and underworld nature of the music works quite well. Clearly there’s song writing talent here (granted with Undergang’s vocalist, this was going to be the case), and the fact that the mastering was done by Cauldron Black Ram/StarGazer’s Damon Good, the overwhelming murkiness of the demo appears to be intentional. If murky, cavernous death metal is up your alley, seriously don’t miss this, its up on bandcamp for name your price and is a pretty solid 9 minutes of festered death. Despite the French title of this demo, Axis of Light is a 2 piece band hailing from Manchester in England. Axis of Light might be the more well known of the three bands I’m covering here, namely due to being signed to underground powerhouse label Fallen Empire, despite them playing what is essentially extremely raw black metal, emphasis on the raw. To cover that section first, the four songs (covering 18 minutes) on L’appel du vide are extremely raw cuts of black metal, with the guitars producing high end, high gain tremolo picked riffs full of melancholy, meanwhile the vocals are wretched as anything, quite often dominating the high end, threatening to clip and shred holes in your ears. The drumming falls behind in the mix, more often than not being dominated by everything else, but still managing to not be neutered by this fact. 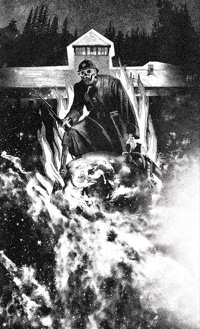 Musically L’appel… ties together the common black metal aesthetic of misanthropy with the more melancholic aspects of black metal; riffs often basking in mood dampening tremolos while Axiom’s wretched vocals sounding impassioned and on the verge of breaking. Much like with Phrenelith’s s/t, the production really does aid to the overall aesthetic on display here and I can’t imagine that the sheer emotion and misanthropy would be quite as impacting without the rawness. Cannot recommend this demo enough for anyone who can handle raw production, Axis of Light have dropped another release that is A grade, and props to Fallen Empire for continuing to pick up some ridiculously great quality bands. Also available for name your price on bandcamp.